Finely tuned to mould around your body shape, each Vi-Spring mattress is a one of a kind. Developed to provide a luxurious sleep on any size or shape of bedstead, the Traditional Bedframe mattress is individually crafted to order using platinum certified British fleeces and thousands of pocket springs. Over 1200 hand nested calico pocket springs adjust and respond to the movement of the sleeper providing independent support and minimising roll together. Wool spring protector pad protects the mattress from the bedstead. Mattress Springs - 1254 luxury pocket springs in 5’0 (150cm), 1.52mm Vanadium steel springs, 56mm in diameter, individual sewn calico pockets, hand formed into a honeycomb nested unit. Mattress Border - 21cm deep with two rows of genuine hand side-stitching, horizontal handles, air vents on all sides, border edges upholstered in protective lambswool, finished with piped ticking. 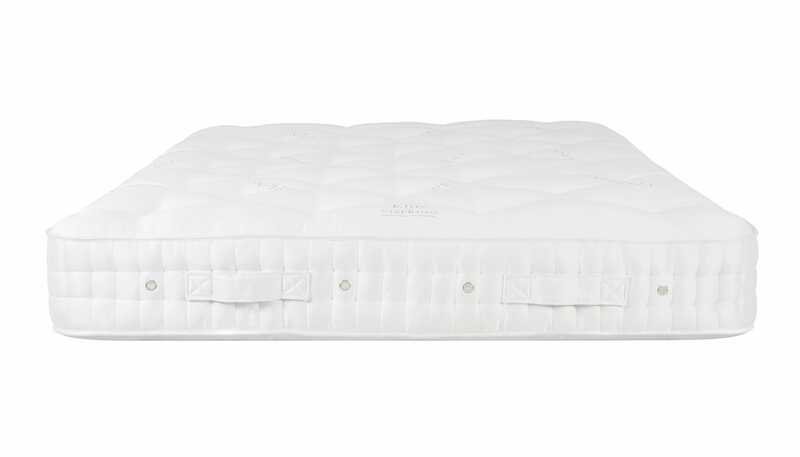 Mattress Upholstery - Upholstered with a wool spring protector pad, then 1350gsm bonded British fleece wool and cotton, overlaid with two layers of 900gsm blended British fleece wool and cotton; hand tufted with felt washers. Covered with satin ivory Belgian ticking from our Collection.